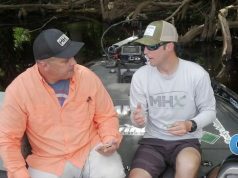 Soft plastics are the key when fishing Kissimmee (or gator) grass that is matted up, or really anywhere a fish can get out of the sun, and the Gambler Big EZ is the perfect bait. In this article we go over how we like to rig and fish the Big EZ for big Florida bass. Everyone in this part of the world knows about the Gambler Big EZ. We generally rig this bait with a 7/0, 1/8 oz, screw lock swimbait hook. It’s a big hook, but we are targeting big fish, and this hook has a center pin screw lock on it, so it keeps it centered and allows it to run true. We are hunting bass that are coming out of the pads and coming into the Kissimmee grass on the outside looking for bluegill, shiners, or shad and will blow up pretty violently on this bait. Anytime fish cruise the grass lines and the Big EZ comes barreling through there, bass are going to slam it because the paddle tail creates a ton of action. The Big EZ can be rigged on a regular oversized worm hook as well, but we definitely prefer the swim bait hook. This bait also has a groove in the back so you can run the point of the hook out and turn the hook in the bait, and it stays to a point where you can run your hand over the top just like you would be running over the pads. 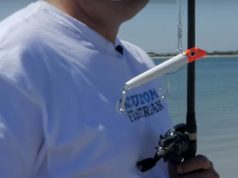 Another reason we like the screw lock is because when you press on the bait, it’s has some give, and the hook point will pop out under enough pressure. If the fish end up in real heavy cover you can just tuck the hook point into the body further. We typically run it just barely out and that’s how the bait is designed to be rigged by Gambler. Let the fish tell you what’s going on when it comes to weight size. This particular hook (we fished in the video) comes in 1/4 oz. and 1/8 oz. You can run the 1/4 oz. if you have a quick enough reel to keep it up, but if you get out to the grass lines you can ease it out and kill it so it glides out and the tail kicks causing the fish to eat on the drop. For the rod, we like to use the MHX-MB874 which is a 7’3” heavy blank. We carry 3 or 4 of this same blank on the boat at any given time. It’s Florida, were throwing 50 lb. braid and 20 lb. fluorocarbon, so a heavy action is key. We also like to use small guides, but no quite micros, because we are throwing straight braid or fluorocarbon so there are no leader knots. As for the reel, we recommend using a 7:1 ration reel with the MHX Winn grips. The Winn grips don’t get hot so you can have that power to set the hook all day in the Florida heat. So give the Gambler Big EZ a try. It is easy to cast and work, and if it is near grass and pads lines hold on – because the strike is awesomely violent!